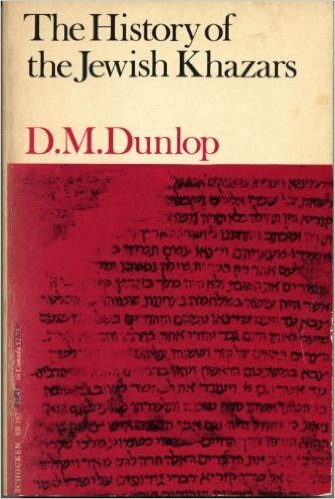 The History of the Jewish Khazars, book written by D. M. Dunlop. published in 1967, Princeton University Press. 292 pp. For the sober historian speculation about what might have been is a frivolous distraction, but for those of us with less responsibility it has its charms. What would have happened if Xerxes’ invasion had been successful, or if Charles Martel had not driven the Moslems back behind the Pyrenees, or if the Russians had adopted the Christianity of Rome rather than of Byzantium? With these questions we are familiar. We are less familiar with the questions that the Khazars suggest. What would have happened if the Khazars had not kept the Moslems from breaking out north of the Caucasus, or if they had been able to maintain their state, or if their kin the Turks, Bulgars, and Magyars and their neighbors the Russians had followed the example of their rulers and aristocracy and adopted Judaism? These are idle questions, of course, but they are not fantastic. The Khazars were not a myth invented by Judah ha-Levi in the 12th century as a convenient narrative vehicle for his theology. They are not even an invention of the Arab League, which would have it that modern Jews are descended from them rather than from Palestinian ancestors; or of American anti-Semites, of whom some now refer to “Khazars” as they once referred to “Eskimos,” for coy concealment, and others try to invest the name with an uncanny and sinister quality. From the 7th century until some hundreds of years later the Khazars were a power where Asia Minor meets Europe. Mr. Dunlop, citing Constantine Porphyrogenitus, reminds us that in the 10th century letters to their ruler from the Byzantine court, for which ceremony was no trivial matter, “bore a more handsome gold seal than that judged necessary for correspondence with the Pope of Rome or the successor of Charlemagne.” Khazar princesses were wives and mothers of emperors in Constantinople, and more than one Caesar of the Eastern Roman empire was enthroned with Khazar support. The Khazars ruled in the area more or less clearly defined on the west, south, and east by the Black Sea, the Caucasus Mountains, and the Caspian Sea, and vaguely on the north by the Volga and Don Rivers. It was they who defeated the repeated attempts of Islam at its most virile and expansive to push into Eastern Europe. Poor as our reliable information about them is, we can be sure of their importance before the destruction of their state, probably in the second half of the 10th century, by the Russians, or at the latest in the 13th century by the Mongols. The Khazars were a Turkic nomad people from Central Asia who arrived in the region north of the Caucasus probably in the 6th century. They had the Turkic religion, “Shamanism”; and Turkic political institutions, government by a khaqan, a hereditary monarch similar in some respects to the Merovingian do-nothing kings or the Japanese emperors under the shogunate, and by a beg, the chief military authority. The Jewish accounts say that the Khazar ruling class was converted to Judaism toward the middle of the 8th century. Some modern scholars think this date is too early by about a hundred years, but Mr. Dunlop judges the weight of the evidence to be in favor of the tradition. Piecing together bits of information from Hebrew, Arabic, Greek, Persian, Turkish, Russian, and Chinese primary sources, and surveying the work of modern scholars in an equally wide range of languages, he suggests that for the first fifty or sixty years the Judaism of the Khazars was quite superficial, that about the year 800 there was a reform that tried to introduce a more normative Judaism, and that the Khazars can best be described as Judaized Turks. He agrees with the scholarly consensus that the Jewish Khazars were a minority in their own kingdom and that Christians, Moslems, and pagans were tolerated. But why did the Khazars adopt Judaism? Judah ha-Levi’s Sefer ha-Kuzari and the disputed letter of King Joseph to Hasdai ibn-Shaprut speak about an angel appearing to the king in a dream and about a subsequent religious debate. As between this and the modern hypothesis that the Khazars chose Judaism because they had become too enlightened to remain heathens but wanted to avoid subservience both to Christian Byzantium and to the Moslem caliphate, most of us would unhesitatingly side with the modern hypothesis; are we not modern? Still, is it true that the only alternatives to Khazar paganism were Judaism, Christianity, and Islam? The Uigurs (from whom we probably got our word ogre) were a Turkic people like the Khazars. Mr. Dunlop cites an account of their conversion from paganism to a higher religion after their ruler’s dream and a religious debate, but their higher religion was Manichaeism. (A medieval source implies Buddhism.) The example of the Uigurs shows that even if we accept the political reasoning of the modern hypothesis—and it does not appear to have impressed those contemporaries of the Khazars who turned to Christianity or Islam without yielding to emperor or caliph—the Khazars need not have chosen Judaism. Why did they choose it? Was Judah ha-Levi right in the essentials? When it comes to such problems Mr. Dunlop lets us down. Or perhaps it is his publishers who have let us down, by giving his book a misleading title. (I cannot begin to understand how they could bring themselves to publish it with one poor map.) Of a history of the Khazars we may expect that the author will ask himself why they decided to become Jews, if only to confess that too little is known for an answer. Of a monograph on the historiography about the Khazars we would be less justified in having such expectations, and it is the monograph more than the history that Mr. Dunlop has given us. The raw materials for a history he has assembled and assayed with judicious learning. He has done well what he set out to do, but it is a pity that he did not decide to do more.